Hello! 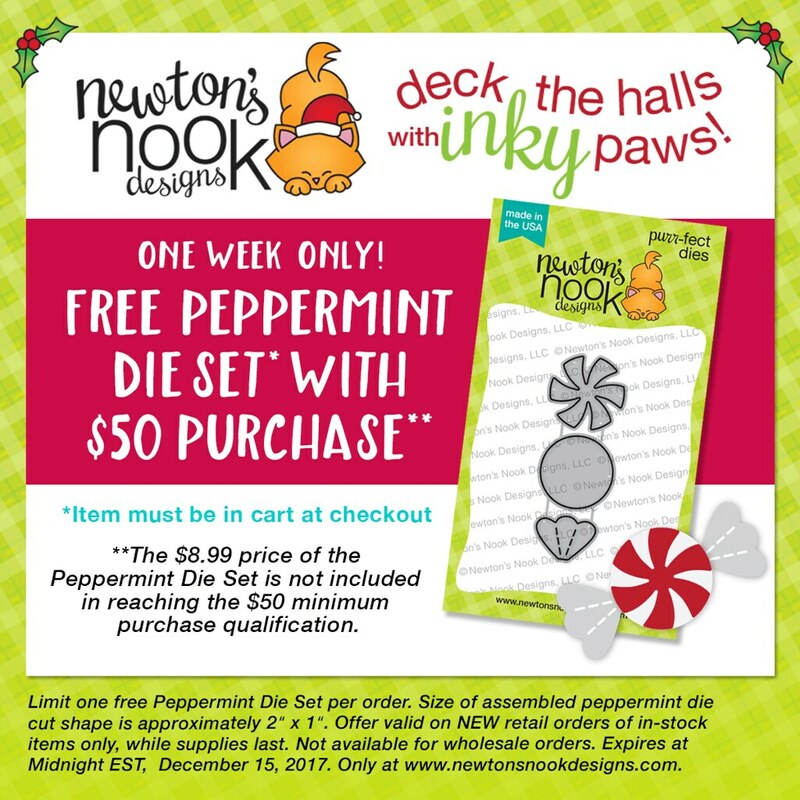 I am really excited to be a part of the Deck The Halls With Inky Paws Blog hop with Newton's Nook Designs! Being a huge animal lover their cute stamps really speak to me. Be sure to to read on to the bottom of my post to find out about a fun promotion they have going on right now, and how you can win a $20 gift certificate to Newton's Nook Designs! For my card today I used a really cute stamp set called Fox Hollow, and I also used the new Snowfall Stencil, which I love! For my background, I blended Picked Raspberry and Blueprint Sketch Distress inks onto some smooth Bristol Board. I then sprinkled with water. When that was all dry, I used the Snowfall Stencil and embossing paste. I cut a white snowy hill out and stamped the sentiment in the lower left. The foxes and trees were colored with Copic markers and cut out with the coordinating dies. I added those with foam tape. Thank you so much for stopping by! Enjoy the hop and Merry Christmas! Sooooooo beautiful and dreamy!!!! Stunning card and coloring!!!! Coloring is really awesome!!! Love these adorable foxes. Love the coloring on your beautiful card! This is so cute! I love the colorful sky behind the cute little foxes! 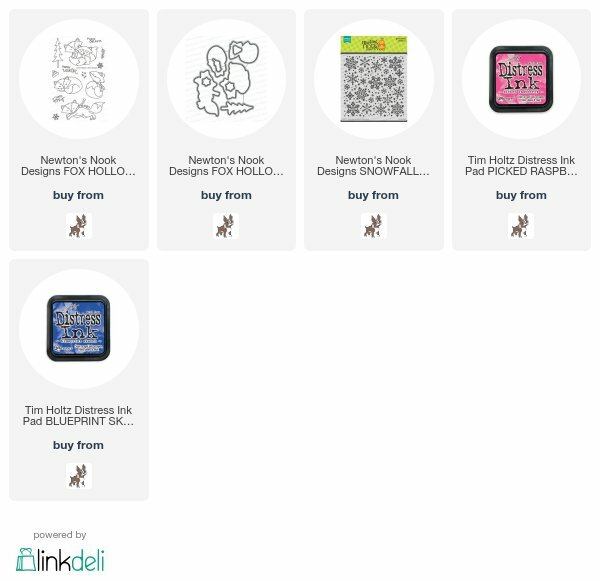 Thank you so much for being part of our Deck the Halls with Inky Paws blog hop!! Such a bright and beautiful sky! And those foxes are adorable. Adorable! This is SO sweet! I love the tiny foxes, all nice and warm in their scarves! I am so partial to those foxes... adorable! Beautiful colors and details on your pretty card! What a great background stamp! So peaceful they are on the happy sweet background! Nicely done! Your coloring is so beautiful.. Great card.. love these foxes! 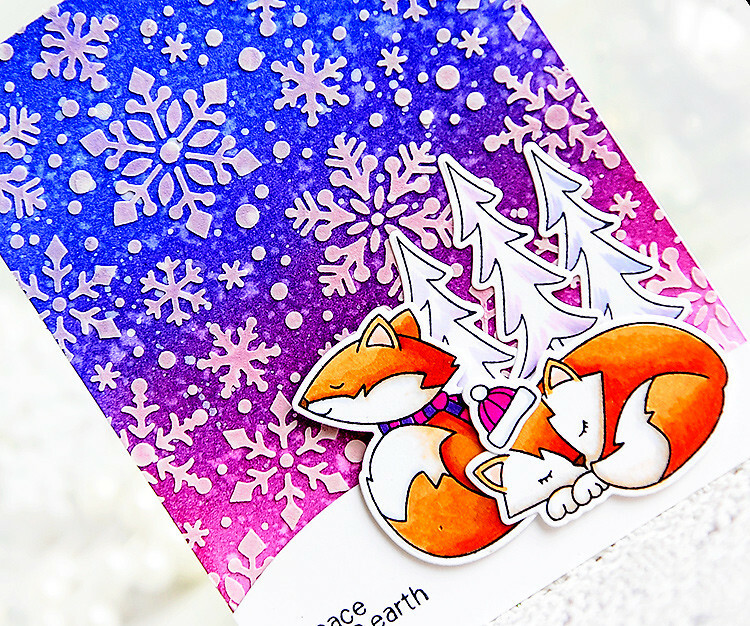 Wow--super snowflake background for these cute foxes. This is so wonderful. I have some embossing paste just itching to go. I do love the Fox hollow set. Nicely done. Wonderful background and those adorable little foxes! Too cute. Cheers. Ohhh my goodness! This is simply beautiful! Loving the vibrant colors on the backgroun with the snowflakes, so dreamy! Kay, this is positively GORGEOUS. The sky you've created for this darling pair to snooze under is gorgeous! What an incredible card Kay!! Your bright colors blow me away EVERY time as I see your blog. So glad you are joining us, because this card is again so pretty! Beautiful card! 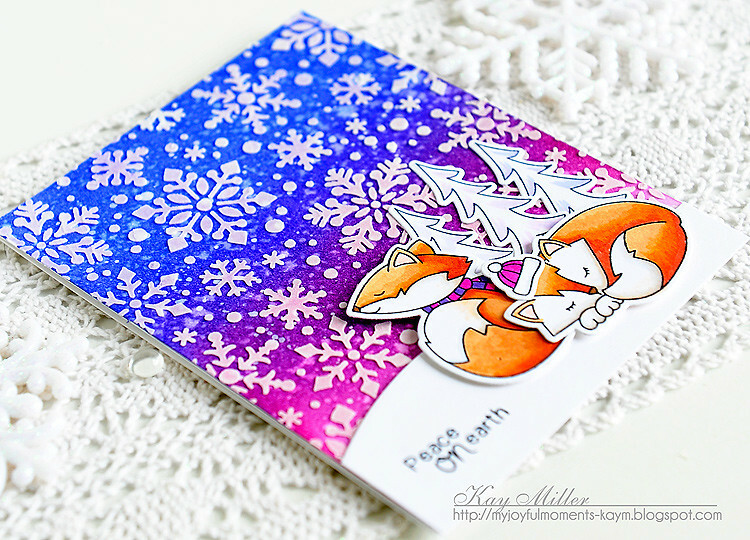 Fabulous work on the coloring, background, foxes, and snowflakes. That sky color blend is gorgeous, Kay. The stencil you used makes it look so snowy! Wonderful. You've colored your foxes beautifully and created an outstanding card. Thank you SO much for sharing! Hugs! So fun Kay! BRRR you created a beautiful wintry season right there on your card! So festive and fun! Love you colloid the distress inks background! Oh, I definitely get a peaceful feeling looking at your card! It is beautiful! I love the colors you chose for the background and the perfect NND sentiment! That background is simply incredible! And oh, your little foxes....such a great card! So glad you joined the fun this week. Uber gorgeous background for these sweet foxes! What a beautiful background! I'm so impressed that you managed to strike exactly the right balance so the foxes weren't overwhelmed by those bold snowflakes. Plus I love the little hat on the sleeping fox. It's details like that that make me smile when I see a card. Thanks for sharing your creativity with us! OMG, soooo cute!! Love those sweet foxes. Those foxes are too cute against that gorgeous snowy background! Beautiful card! I love the snowy background! Beautiful colours on this card. Thanks for the inspiration. 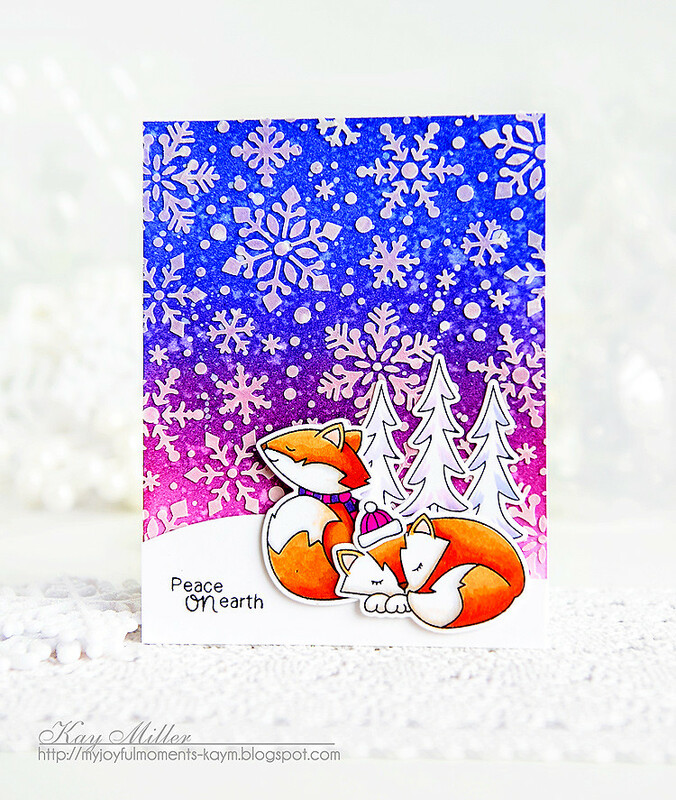 Oooo you made the snowflakes come to life and the foxes are cute all snuggly! Pretty colors.